So I bought some security paper. It’s nice security paper, but it’s not quite like the Hawaiian certificate paper. That’s no surprise, but if we want to do a good job replicating the White House PDF of the President’s long form birth certificate, we’re going to need to make a good original to work from. … the President’s birth certificate released by the White House was an electronic document, we literally had the capability to go into that file and turn off the green safety paper background. Anybody that gets documents anywhere realizes that safety paper is supposed to be a source of comfort that it is an official document. We had the ability to turn it off. 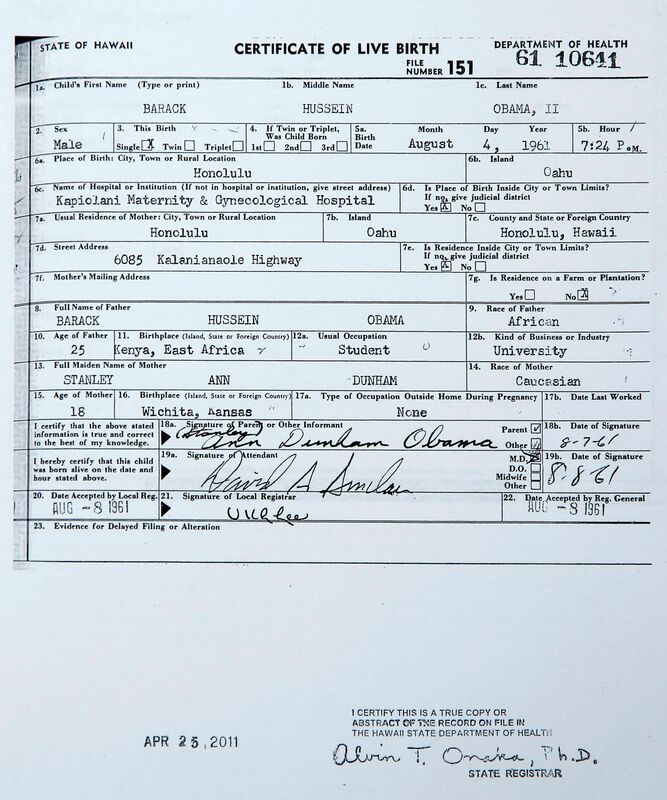 We turned if off and we scanned the President’s birth certificate onto a hard copy paper document, a paper, a safety paper document we actually laid his birth certificate on top of. As always, what Zullo said is misleading. He would lead the listener to think that that he could turn off the safety paper background and leave the rest of the document intact, but of course that’s not true (details below). If one turns off the background layer, much of the form, text and signatures goes away with it. The halos are an interesting artifact, basically white areas around the text. You can see it here in this example around the word “Mother”. The halos (actually blank areas) appear all throughout the document, prominent when you look the background layer of the PDF by itself (click for full-sized image). 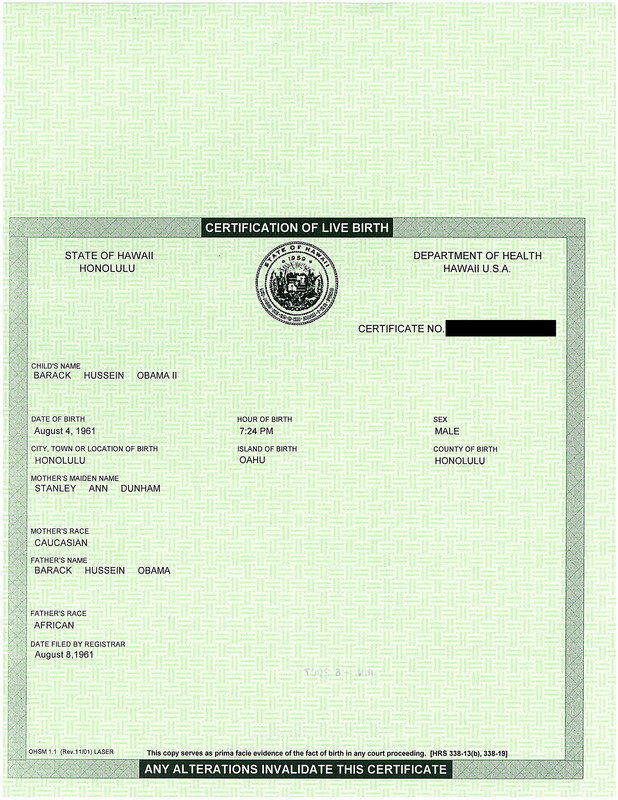 Of course, birthers say that these blank spaces were places where the information from someone else was cut out to put Obama information in place it when combining certificates. That theory falls apart looking at the background layer without the text at full size. You can read the text by just the halos! So they aren’t the result of removing something else. But what Zullo said, no matter how much nonsense it was, had a useful hint. Even though turning off the background layer would obscure much of the certificate, there would still be some black text left, and that text, printed onto security paper would make for a good test for halos. Wow! Sounds a little like “have you stopped beating your wife?” In the real world, the Cold Case Posse is a bunch of volunteer clowns. Obama’s Selective Service application is confirmed both by FOIA from the Bush administration, and an online registration query run by a reporter in California. And most important, I think anybody in the US military ought to know that they don’t police the political process in the United States. There are laws against that sort of thing. This isn’t some third-world dictatorship, despite what birthers may think. We can only assume that your query is not a legitimate question and is some sort of nonsensical joke. Late last month, Dr. George Little had promised future openness and “no spin” from the military, and I had hoped that his public affairs officers would keep that pledge. I have always asked serious questions in my contacts with your office, and I assure you that this query is very serious. In fact, it is a matter of national security, as Zullo has stated on many occasions that there is no evidence that Obama is even a U.S. citizen. My father was a veteran of World War II in the China/Burma/India theater and I always had great respect for our military. I can therefore assure you that I have no desire to engage in “absurdities” with anyone in your office. I understand that Rondeau is dead serious. There are lots of kooks that are dead serious, but that doesn’t make them any less a kook. If the military had any responsibility related to the issues that Rondeau raised, perhaps a more complete response might have been warranted, but they don’t have any such role. She might as well have been demanding that they stop fluoridation of the water or stop the teaching of evolution in the schools. We are so desparately (sic) infiltrated by the enemy now. And, I feel within a very short time, weeks, we’re gonna’ be in some deep doodoo. I think there are many sleepers about to be activated. We’re going to have to be vigilante just to protect ourselves, family, etc… within the short term. I think you, and most of us here on the same page have fought the good fight against an enemy that has had time to assemble over a period of time. Hide your food & the other "you know whats"… I have a feeling they’re gonna’ make a move soon. If it comes to this scenario….we’ll find out just how many we have on the right side. 1Most readers here will be familiar already with this story. I include it for posterity. 2Perhaps “nuts” would have been more appropriate, pun intended. The Electronic Verification of Vital Events (EVVE) system is a national network exchanging information between government agencies to verify birth events. It’s a hub-and-spoke architecture centered at the National Association for Public Health Statistics and Information Systems (NAPHSIS), of which I used to be a member. Let’s say that you want to get a drivers license. You show up at a DMV office with your ID and your birth certificate. In years past, that birth certificate contained security features to show the DMV that it was authentic. That’s not as important now. With EVVE, the DMV sends an electronic query to NAPHSIS who brokers it to a state vital records server, which then verifies (or not) the information and routes the reply back to the DMV. 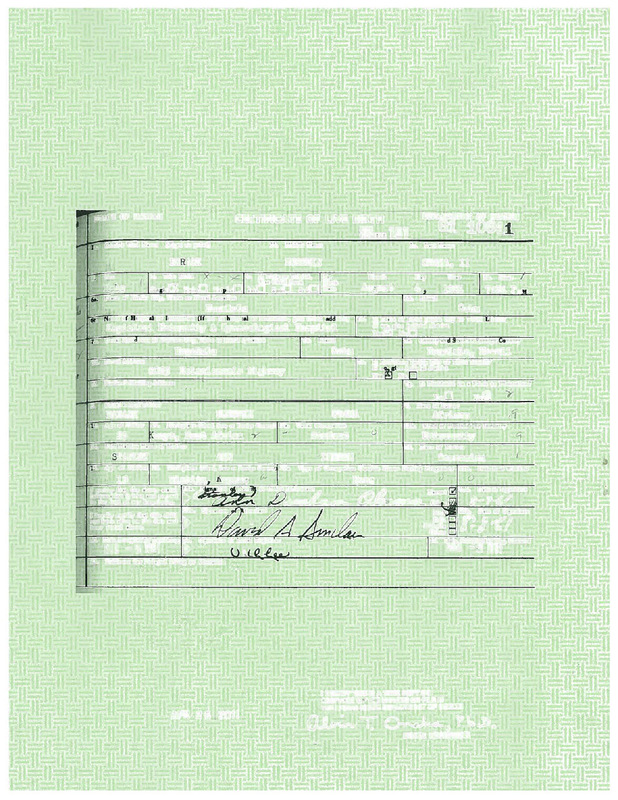 If the birth certificate is fictitious or altered, EVVE will say so. This electronic wizardry is designed to support the REAL ID Act of 2005. I had some tangential involvement with EVVE implementation early on. Most states have EVVE implemented today [link to Microsoft PowerPoint file], although not every implementation has all of their records in electronic form. Hawaii has birth records back to 1909 online for EVVE (well done, Hawaii, well done) while Connecticut only has records since 1993—tough luck to George W. Bush if he wants to get a drivers license verified through EVVE. 😈 New York isn’t online yet. 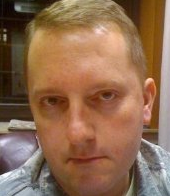 This electronic system and the REAL ID Act might have been the reason Doug Vogt imagined that federal law required all states to store electronic images of their birth certificates. EVVE, however, doesn’t work with images; it works with text. 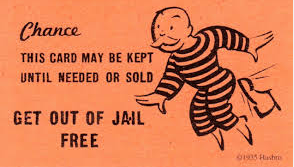 Most vital records fraud involves real certificates carried by someone other than their owner. That’s why a photo ID is necessary in addition to a birth certificate to get a passport. EVVE pretty much eliminates fictitious and altered certificates, but for records not in the EVVE system, there’s still the fall back security built into certificates, specifically, security paper and seals. Security paper isn’t designed to copy well (or be easily altered). This means that anyone trying to do scanning experiments with President Obama’s long form birth certificate is at a severe disadvantage without some real security paper to test with and this is why it came as such a shock to me when I saw Cold Case Posse document darling Garrett Papit testing with a sample birth certificate clearly NOT on real security paper. 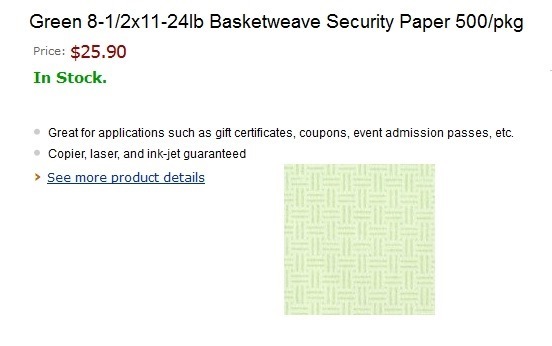 Not that the Cold Case Posse results had any validity to to begin with, but at least they could have forked out $25.90 for a pack of off-the-shelf basket weave security paper. So where are all those PayPal donations going? I’m no expert on security paper, but I know a lot more than the average guy. When I worked on vital records projects for the State of South Carolina, I became familiar with the security features on their certificate. If you showed me anything less than a spy-grade fake for a 1977 SC certificate, I could spot the fake in a second–and without even a magnifying glass. I don’t know if my technique is public knowledge or not, so I won’t say anything more about that except to note that intaglio printing with machine engraving was used on the certificate and the pale colored background rubs off if you try to erase it. 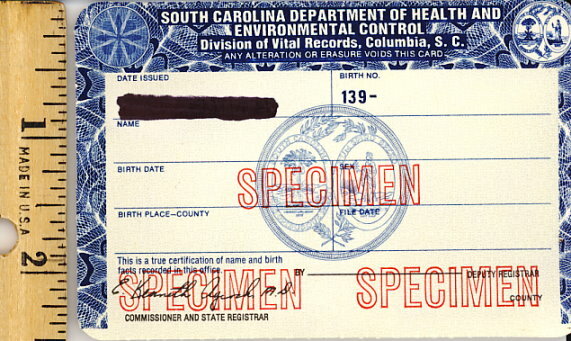 Following is a wallet-sized specimen certificate from South Carolina used by county offices in 1977, intentionally scanned at a low-enough resolution to obscure details. I had a conversation with a vital records official who showed me some of the publicly-known security features in that state’s certificate. They included tonal gradations, micro printing and thermal ink. She said that if she showed me the other security features, she would have to kill me. (By mutual agreement, I was not shown the other security features.) If you’ve ever received a pay check from ADP, an out-sourcing payroll company, you’ve seen the three features I mentioned (the thermal ink is on the back). I attended a seminar by a fellow who helped design the ADP payroll check who talked about its features. Finally, I sat for hours on end in a trade show booth, next to the booth of the American Bank Note Company who was pitching their portfolio of security features to state officials. Some banknote certificate paper can cost upwards of a dollar a sheet. It has always puzzled me how simple a Hawaiian certificate is, compared to the specimen above, an ADP check, or the the Indiana certificate that I received a tour of. There are Hawaiian birth certificates on banknote security paper for some years that I have seen (but don’t have a handy link to). 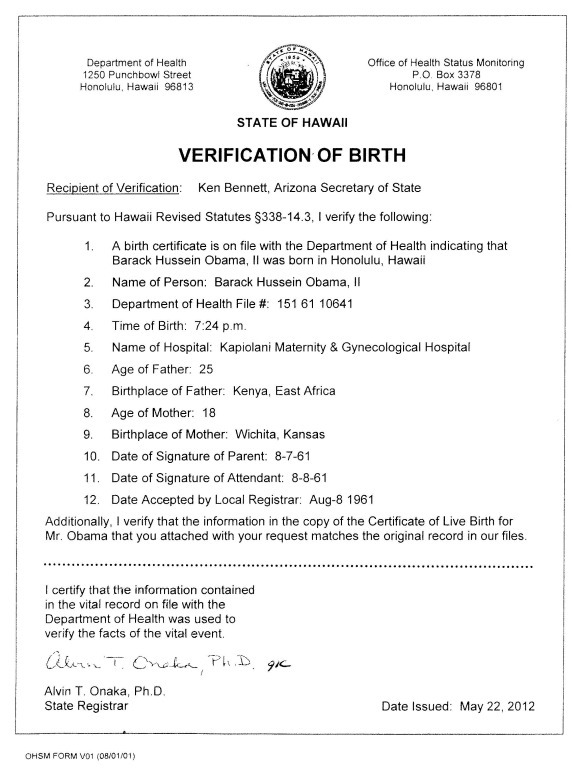 On the other hand, I have never actually seen an actual certified copy of a Hawaiian Birth Certificate. There may be security features not picked up on any scan. Somebody said that there was UV ink on it. 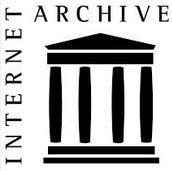 Perhaps it relates to how far back Hawaii has their records available for verification online. Since this article was originally published, I have obtained some Simpson DesignSecure™ Basketweave Pattern security paper that appears to be very much like the paper used by the State of Hawaii. When I started to write this article, the title was going to be, “Arpaio should dissolve the Cold Case Posse,” but then I realized that the Cold Case Posse is an independent non-profit corporation not run by the Maricopa County Sheriff’s Office: The MCSO didn’t charter it; they don’t fund it; they don’t oversee it; they can’t make it go away. They can, however, sever all ties with it. In October of 2006, Sheriff Arpaio ordered the creation of the MCSO Cold Case Posse (CCP). The purpose of the CCP was to assist in the investigation of Cold Case Homicides. Since its inception, the CCP has been placed under the guidance and control of The General Investigation Division’s Homicide Squad (GID). Nothing on the CCP web site suggests that they have ever actually assisted any homicide investigation, much less solved any cold cases. 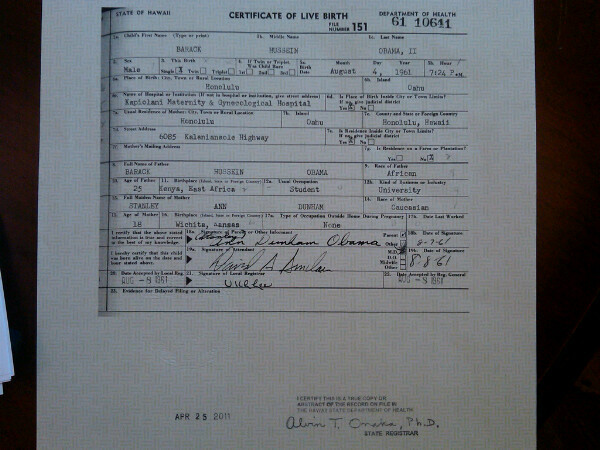 It’s 100% Obama birth certificate. So if they aren’t doing what they are supposed to do, then they shouldn’t exist. The lawsuit, Klayman v. City Pages et al, was filed in March. Klayman makes an aggressive ad hominem argument against the defendants in his complaint, basically saying that the defendants are pursuing a “radical homosexual agenda” that is harmful to children. In addition to the inappropriate touching issue, Klayman also says that the stories misrepresented a disciplinary action against him. A number of items appear on the docket including an amended complaint and motions to dismiss. Yesterday US District Judge Anne C. Conway ordered Klayman to show cause why the case should not be dismissed for lack of prosecution—Klayman didn’t file the required Case Management Report within the deadline. A motion to dismiss for failure to state a claim is also pending. The Phoenix New Times, a metropolitan newsweekly in Phoenix, Arizona, has a circulation of around 79,000. Their web site has a ranking in the top 6,000 web sites in the US according to Alexa.com, which is better than the Arizona Daily Star newspaper web site. They have had a long-running feud with Maricopa County Sheriff Joe Arpaio. At one time two newspaper founders were arrested (charges quickly dropped) in the wake of Sheriff Arpaio’s home address being published on the paper’s web site. A subpoena was issued demanding the names of everyone who had read the article on the web site. 😯 Pretty crazy stuff. The Wikipedia has more on that story. The article itself is not especially informative—it just points out that a Xerox machine was responsible for what the Cold Case Posse thought were the unmistakable marks of forgery. The reason that I bring up the story is that we have a prominent news source letting the people of Phoenix know (again) what idiots they have in the Sheriff’s office. Now, this expert is the guy who is so technologically savvy that he uncovered all of these small details in the “forgery.” He uploaded the video to YouTube, which shows him unable to figure out how to scan a document on the copier and send it to his e-mail. Papit himself told me in email that the reason he couldn’t email the scan was that the machine was defective, and that a “card” had to be replaced. Papit says that he just made the video to show someone how the machine was failing. That’s plausible. I hadn’t watched the video before today, and I was somewhat surprised by what I saw. 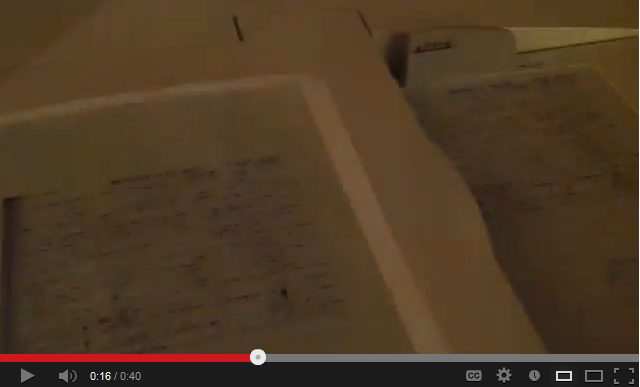 The video swings right to reveal Papit’s sample birth certificate, presumably the one he tested with. It’s not on safety paper! You can tell by the white border around it. The Cold Case Posse wasn’t even using real safety paper! Oh my! One comment to the article mentions a public document scanned by a Xerox 7530 that has some of the same “forgery” marks that the Cold Case Posse clings to. At the top of the first page the “g” in “Agenda” is on the background layer and appears “fuzzy” at higher magnification compared to the rest of the word. The Garrett Papit YouTube video has been removed.